June/July National Geographic Adventure magazine again describes the tragedy at Ranthambore and the tigers the Indian government failed to protect. I was in the Corbett a few days back. I found the younger generation of gaurds & officers very proffessional, dynamic in their attitude & pushing...a welcome change from the older fellows, who had that irritating languorousness in their ways! I saw an urgency in their beats. While fishing for Golden Mahaseer on the river, I saw one of them keep an eye on the proceedings, from a distance, making sure that I flouted no rules of 'catch & release'. I am very optimistic, the tiger will survive, atleast in the sanctuaries. The casualty has been those unfortunate beasts who once lived in reserved forests. don't get me started at the Indian government and wildlife authorities and their failure to protect these wonderful cats! We just visited 5 (!!!) tiger parks and we were able to see tigers only in 2 (!!!). I did a trip report on that trip. We spoke to lots of guides and the guides trained by andBeyond (former CC Africa) have a far better understanding of wildlife and its protection than the "naturalists" at the National Parks. We have got the impression that the Wildlife servce, government and "naturalists" see these cats only as a kind of money printing device. They really give a sh§§ whether 5 or 100 tigers bring them money and tips. They seem satisfied as long as they have SOME tigers left which brings tourists. We were told that it will most definitely take one more generation to grow into responsibilities which really understands and appreciates how precious these cats have become now and care about wildlife conservation. And it's not only about an INDIAN asset! It's about all human's asset which regrettably lives in India and therefore A UN body should interfere with the careless and irresponsible actions these Indian guys allow to happen. A country which wasts money by building nuclear weapons but neglects its wildlife's protection acts sinfully against human intelligence. Of course the pressure must come from outside the country because 1.3 billion people of whom most struggle for their daily survival cannot be expected to take care of these cats. And it's also about "loosing ones face" - a decision won't be corrected because one could loose one's face. Doesn't matter how wrong and insane the decision might has been. I doubt by the time that government has understood there won't be any tigers left in the wilds. But the pockets will be filled by then - and who cares.........for the rest? It's all too sad and must be considered a crime! of what sanctuaries are you talking????????????? You mean these national parks which have no fences and people/poachars can enter and leave to their liking? Anti-poaching units is a term they still have never considered to introduce! Villiages are still within some parks. Tigers can leave the "sanctuaries" also to their liking and you have got one guess for free what happens to tigers which leave the "sanctuary". Panna lost more than 40 tigers within only a couple of years! A poacher earn more by shooting/selling a tiger than he could possible earn in a lifetime in the country side! The estimation is between 1100 and 1400 tigers are left in the wild. Even the most optimistic conservationists doubt that number. NP's do occasional census. But how? Between Pench and Kanha is a kind of "corridor" connecting these areas leading to some 2500 square kilometers of space. The "estimation" for Pench was 30 to 65 (think of these numbers!) and for Kanha 35 to 60 individuals. Now based on the fact that both park officials have no clue how many cats travel in between these parks they also cannot estimate which individual has been counted by which park. Furthermore Bandavgarh' estimation was about 65 to 90 tigers. Taking into consideration that a tiger needs at least 30 square km for its territory and many teritorries are traversing - the pressure onto these tigers is immense leading to more killings of cubs and adults than necessary. Over and above that interbreeding leads to narrowing the gene pools down which leads to deseases. But despite all this the park authorities are not willingly exchanging tigers with other parks in order to relief the tensions and get new blood into the park. Sanctuary as such is a word they have never heard of or just have a strange Indian interpretation for it. You can turn it in any direction - it doesn't take another 10 years and thy will be gone. For ever! Your concerns about the Indian tiger are certainly well received & appreciated. However, I may not agree with the dismal picture or the conclusions that you have adduced from your visit to 5 tiger reserves. A lot needs to be done to make the tiger safe in their home in India. I am not in anyway trying to defend the red tape & the slow movement of conservation schemes, in this field but to revile India, I take strong exception to. I have closely watched the scene from the time when shooting blocks could be reserved, to the present day, when hunting is banned in India. It is common knowledge that the tiger inhabited the whole of Asian continent, including Siberia, Manchuria, Indo-China, Malaysia, Jawa & Sumatra. It is also a fact that if the tiger is to survive it’s best chance lies in India alone, for all other states have either already lost them or are just a few in numbers. Way back in 1945 Jim Corbett gave only 15 years to it’s survival, when the human population was just one fourth of what it is today, the fact that we still have about 1000 or a little more, speaks volumes for those of us who have made it a mission to save the species from disaster! The laws are right in place & some of the most stringent ever. It is difficult to shoot a pigeon let alone a tiger! The poor villagers / tribal do not have the means or fire power to hunt them. A full bore rifle costs half a million INR, if available. The influential Indian does not go after tigers, elephants or leopards but hunted for sports, the lesser game. No body is even hunting today for fear of legal retribution. If I may recall, a foreign dignitary faced the ignominy of confiscation of Shahtoosh shawls, a couple of years back. The meanest of all the foresters will not have the guts or conscience to condescend killing of tigers. The tiger skin or artifacts made of tiger parts, ivory etc. has no demand in the Indian market. All trophies, even gun licenses issued for sports or residing in proximity to wildlife sanctuaries need to be registered with WL Dept. The question remains who are these poachers? These are well organized international mafia who have the means & markets for these items. The international community will need to curb international trade if the tiger is to survive in the wild!! The wildlife is slowly but surely dissapearing before our very eyes and and all our struggles are like a little blade of grass tossed away by the great stormy winds of humanity...! It's very hard to make a choice or arguments when there is a hungry child or a starving family in between, still we try. Africa, Asia, my little Sri Lanka - it's all the same story. While the villagers may not be able to purchase the firearms themselves, the greedy people at the top of the pyramid will provide them with the necessary means to trap and kill the tigers. Tiger products may not be in demand in India, but they are in China and guess who has the money these days to fund such organised markets? I personally know a former director of "Project Tiger" and several years ago he informed me that the tigers were on the way to becoming extinct because of lack of education and lack of government intervention. Everyone wants to line their pockets. Here is the rogue behind the vanishing tigers in India. 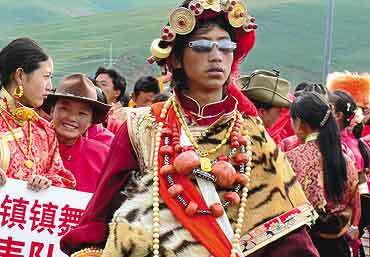 This is where its ending up.In Tibet.You find this clown wearing it for the traditional dance !! Peg these two & the tiger in India are safe. I hate what is happening to tigers and wildlife in general in India. It is sad, distressing and actually causes me a lot of pain to think about it. There is no doubt that what has happened in Sariska, Panna and other parks is appauling. However the comments of spassvogel show a significant amount of ignorance, more so cluenessness about the situation and the realities of the situation and the challenges to change it. You can not save the tigers in isolation of the other problems that persist in India, and you cannot idly blame governments or villages for the situation. Nor can you say that tigers are unfortunate for living in India, as they once lived in China, Indonesia, Thailand, Malaysia, Burma, and Russia and are all but completely extinct in those places - at least in India they are hanging on. No doubt had they lived in the US or Europe (lions once lived in Europe) they would be extinct from there as well. In the US and Europe we have all but entirely plundered our natural heritage yet we quickly cast stones at other governments who aren't doing enough to save theirs. "Villages are still within some parks" - of course villages are still within some parks. Villages have existed for hundreds of years before there was a necessity to create parks. The villagers lived side by side with the animals without doing any damage ecologically, until our greed for land, tiger parts, lumber, etc. created a scarcity of forests. Then, when we created that scarcity, our first reaction is to move the villagers and the villages. While addressing the encroachment on forests is absolutely necessary, its hardly accurate to identify this as the cause of the problem. It is merely a symptom. It is not our God given right to be able to visit 5 tiger parks and see tigers in all of them. Its an enormous privilege to encounter one at all, and more our obligation to reduce our greed that leads to their demise.